A San Diego man represented by Mike Bomberger of Estey & Bomberger has received $3.5 million after being struck and run over in a Costco parking lot by an elderly driver. Miguel Rodriguez, 49, suffered broken bones throughout his body and a punctured lung as a result of the accident, which occurred in March 2010, according to the San Diego Police Department’s accident report. “This accident was the result of an elderly driver who mistakenly pressed the accelerator rather than the brake. Unfortunately, this accident scenario is not uncommon for elderly drivers,” said Bomberger. “There’s a strong need for elderly drivers to maintain their independence. But such needs must be balanced against public safety and the multiple accidents and serious injuries that occur as a result of elderly driving errors.” We believe there should be more frequent testing for elderly drivers to ensure their ability to drive safely and to protect the public from such tragic accidents.” Estey & Bomberger is currently representing people in three separate cases that involved devastating injuries from elderly drivers. Steven Strauss of Cooley LLP in San Diego is representing the family members of Junior Seau, who recently brought a wrongful death suit in California state court against the National Football League and helmet maker Riddell Inc., claiming the brain trauma that the famed former linebacker suffered on the field led him to commit suicide. The complaint asserts that Seau developed chronic traumatic encephalopathy after being hit repeatedly in the head over the course of his football career, and that although the NFL was aware of the evidence and risks associated with repetitive traumatic brain injuries for many decades, it deliberately ignored and hid the information from its players. Higgs Fletcher & Mack announces the hiring of new partner James (Jim) J. Eischen, Jr. With more than 25 years of legal experience, Eischen is a national expert in medical physician reimbursement compliance who represents a variety of medical practices and health care IT companies across the U.S. and internationally. Regularly utilized by the American Association of Private Physicians (AAPP) to lecture on medical compliance issues for the last four years, Eischen is expanding his physician compliance outreach to integrative/ holistic education conferences both locally and nationally. Mr. Eischen also maintains a health news aggregation service for physicians that is utilized by the AAPP. His background also includes 24 years of dispute/litigation expertise involving corporate, real property and commercial litigation as well as transactional representation for commercial and residential real estate developers. Prior to joining Higgs, Eischen maintained a successful practice, the Eischen Law Group. He earned his undergraduate degree from Creighton University and his Juris Doctorate from the University of California at Davis. Erwin J. Shustak and Jennifer S. Hegemier have been selected by San Diego Magazine as “Top Lawyers in San Diego.” Erwin was honored for his excellence in Securities, Finance and Complex Business Litigation and highlighted as one of San Diego’s “Top Attorneys That You Need to Know.” As the founding and managing partner of Shustak & Partners, Erwin’s trial and arbitration experience includes business, securities, and financial fraud; breach of contract; real estate transactions and disputes; employment disputes; unfair competition, non-compete and restrictive covenant cases; probate and estate disputes and intellectual property disputes including copyright and trademark infringement. Jennifer Hegemier was honored for her excellence in Civil Appeals and Writs. Jennifer heads the firm’s Appellate Practice Group with 18 years of expertise in a wide variety of issues on appeal, including Complex Business Litigation; Real Estate and Land Use; Bankruptcy; Civil Procedure; Civil Rights; Commercial Contracts; Constitutional Law; Environmental Law; Governmental Agencies: Construction Defect; Anti-SLAPP; Personal Injury; Premises Liability; Animal Law; Family Law; Insurance / Bad Faith; Labor and Employment; Products Liability; Intellectual Property; Professional Malpractice and many others. John H. Gomez, Founding Partner and Lead Trial Attorney for Gomez Iagmin Trial Attorneys, has been selected as a member of the Summit Council, an exclusive group comprised of top civil justice attorneys in the United States. Summit Council members are nationally recognized by their peers as top civil justice advocates. 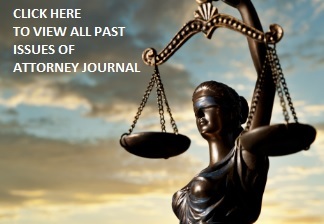 All members have obtained at least one $10 million dollar jury verdict and at least three jury verdicts in excess of $1 million dollars as lead counsel in jury trials, have served as the President or Chair of a state or national civil justice association, or have served as Chair of a plaintiff’s steering committee for a major mass tort or class action litigation. Gomez Iagmin Trial Attorneys is a plaintiff’s law firm specializing in serious personal injury, wrongful death, complex product liability and mass torts. Fish & Richardson has been named to The National Law Journal’s (NLJ) “2013 Intellectual Property Hot List” as one of 20 firms “that have demonstrated creative, formidable talent in litigation, patent prosecution and deal- making” in cases that “often have billions at stake.” This is the second year that Fish has been named to the NLJ “IP Hot List,” which the publication started in 2012. “We are honored to once again be recognized as one of the best IP firms in the country,” said Ann Cathcart Chaplin, Litigation Practice Group Leader at Fish & Richardson. The NLJ noted that Fish retained its long-held title for filing more patent litigation than any firm nationwide and played a leading role in a number of precedent-setting intellectual property cases in 2012. Fish’s 2012 wins include: a landmark victory for Mayo Clinic at the U.S. Supreme Court, an en banc Federal Circuit win for W.L. Gore that clarified a two-prong test for establishing willful infringement, and a Federal Circuit win for Cephalon that protects their $140 million a year AMRIX drug until 2024 and set a new legal standard for proving patent invalidity in Hatch-Waxman cases. Klinedinst PC is pleased to announce the addition of Jamie M. Ritterbeck and Floyd A. Brown to the San Diego office of Klinedinst PC. Ms. Ritterbeck joins the business litigation team, and will work primarily with Shareholder James D. Crosby on complex and general business litigation cases. Prior to joining Klinedinst, Ms. Ritterbeck worked for a busy litigation defense firm in Newport Beach where she handled all phases of litigation, from discovery and depositions to settlement negotiations and court appearances. Ms. Ritterbeck earned her law degree from the University of San Diego School of Law and her undergraduate degree from Florida State University. While in law school, Ms. Ritterbeck interned at the USD School of Law’s Appellate Clinic, where she successfully represented her client before the Ninth Circuit Court of Appeals and the Board of Immigration Appeals, resulting in her client’s release from federal custody. As a result of her outstanding work, Ms. Ritterbeck was honored as the Outstanding Clinic Intern. Floyd Brown will work primarily with the employment law, construction, and real estate practice groups. Mr. Brown has a wide range of litigation experience, including law and motions, drafting and responding to discovery, meeting and conferring with both counsel and clients, and managing client communications. Before being elevated to an attorney, Mr. Brown worked as a litigation paralegal with Klinedinst, supporting all phases of litigation, from legal research, document review/management to witness interviews, and trial support. Mr. Brown graduated law school from Thomas Jefferson School of Law. Prior to law school, Mr. Brown served in the United States Air Force for 23 years, retiring as a Technical Sergeant. While in the Air Force, Mr. Brown served as a non-commissioned officer, and defense paralegal in the Air Force JAG Corp. Mr. Brown served in locations around the world, including Germany, Cuba, England, Bosnia, and is a Gulf War Veteran.